Semi hydroponics with Barry Kable. Plant of the Month: Alcantareas with Bruce Duncan. Samuel Sung on Growing Tillandsias in Singapore. Barry Kable opened the meeting and welcomed guests. 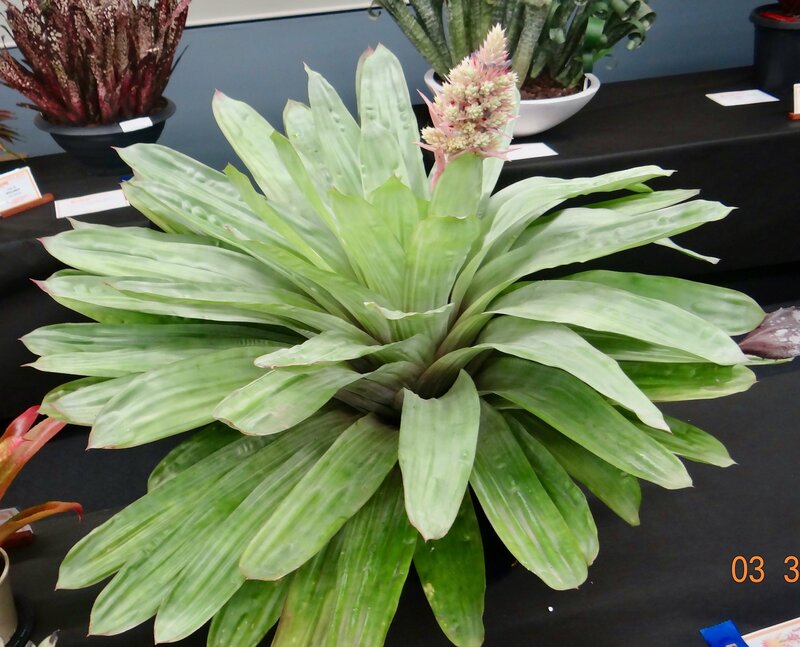 Bromeliaceae, our journal, has just had a new issue sent out. Barry continues to amaze us with his imagination and enterprise. Tonight he introduced us to a new way of growing our broms. Barry pots a variety of plants into a clear plastic pot with one hole about 5cm from the base. He uses gravel or clay balls, avoiding potting mix or soil. He adds water to the pot, and the bottom section retains the water, the rest drains out of that hole. 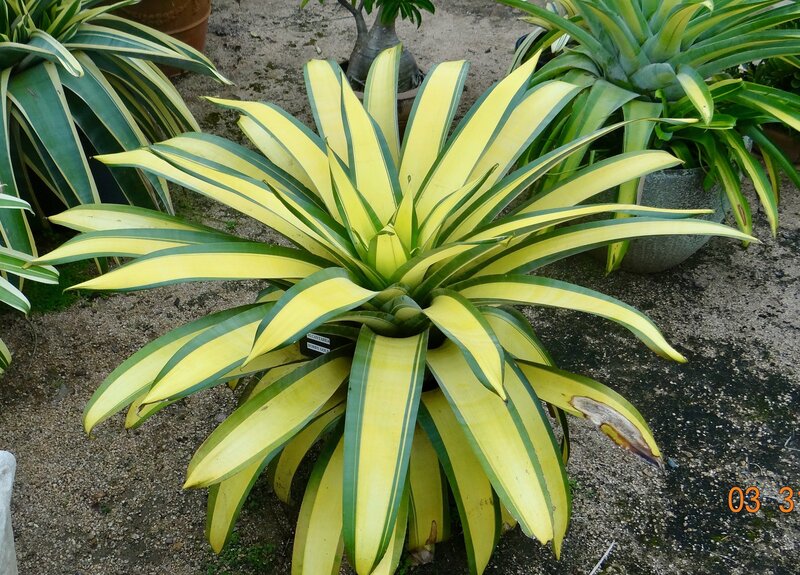 He brought along Alcantarea imperialis, Dyckia, Cryptanthus, Orthophytum, Deuterocohnia, Ananas, Cattleya, and Hoya. And they all looked healthy, loving the semi hydroponic culture. Definition: Semi-hydroponics also known as passive subirrigation is a method of growing plants without soil, peat moss, or bark. Instead an inert porous medium transports water and fertilizer to the roots by capillary action. Water and fertilizer are held in a reservoir and conducted to the roots as needed, reducing labour and providing a constant supply of water to the roots. In the simplest method, the pot sits in a shallow solution of fertilizer and water or on a capillary mat saturated with nutrient solution. Since routine maintenance is much simplified, passive hydroponics can reduce the labour required to maintain a large collection of plants. The various hydroponic media available contain more air space than more traditional potting mixes, delivering increased oxygen to the roots. 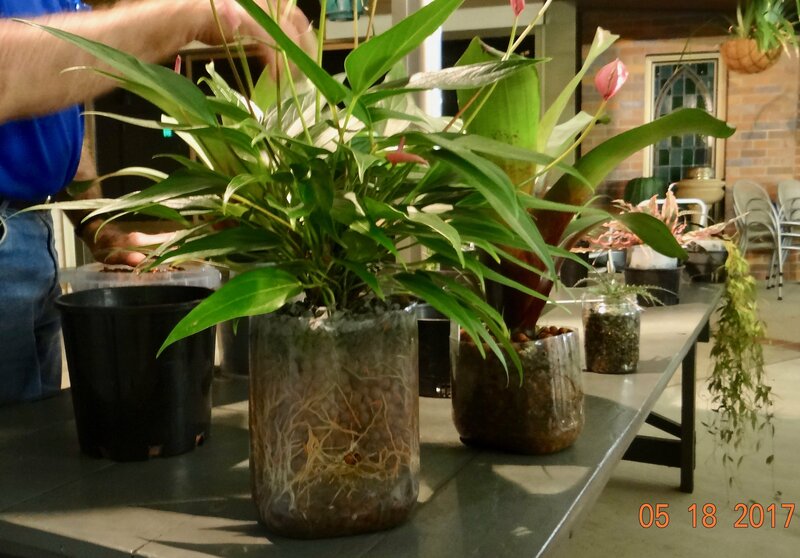 Allowing air to reach the roots is particularly important in preventing root rot in epiphytic plants such as orchids and bromeliads whose roots are exposed to the air in nature. It is important in semi hydroponics to wash out the system from time to time to remove salt accumulation (Wikipedia). 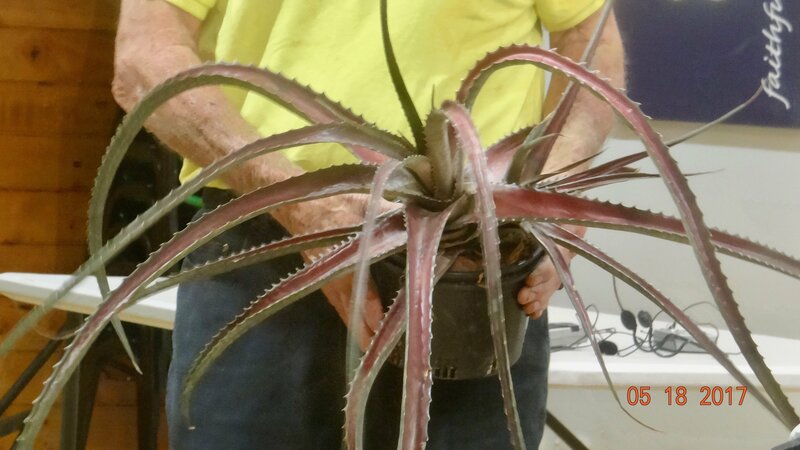 Barry Kable shows Alcantarea imperialis in the typical pot used for semi hydroponic cultivation. Alcantareas appear to be the most primitive plants in the Tillandsioideae family, showing little adaption or evolution. They all come from Brazil, all are found living on rocks ( lithophyllic). They range along the Atlantic Coast of Brazil. They are found growing on massive rock faces almost inaccessible to collectors. In that barren habitat, it probably takes years to flower, ?150 years! However, grown in richer mix, with regular fertilizer and water, they grow quickly, flowering in two or three years. If you grow them 'hard', i.e.,don't feed them, and keep them dry, this delays flowering so that they grow slowly and reach a big size. On the other hand, regular feeding makes them flower much sooner, and brings a green colour. This approach maximises reproduction. There were only 25 species named ten years ago. Now there are 41 species. There are 10 to 15 species in cultivation, soon to increase to 20, as newly collected species come into flower and permit identification and registration. Al imperialis is well known, and Chester Skotak thinks there are 4 to 5 different types. On the rock faces in Eastern Brazil, one sees a massive growth of one type, gradually changing to a different type on the next cliff face. These slow-growing Alcantareas can actually develop a trunk . Bruce showed photos of plants from a variety of growers in Brazil. Morphology seems to change with habitat. Near the wet coast, Alcantareas have broad leaves and form an impressive tank, and are very attractive. Moving inland in Minas Gerais, they are distinctly grassy, without the familiar tank .eg.Al farneyi. It is grown locally, but is not very attractive (see photo). Many flower at night, so are pollinated by moths and bats. The flowers are white to bronze, and shine brightly under UV light. So it is likely they attract pollinators with sensitivity to UV light. The flowers have distinctive recurved petals, ensuring maximum exposure of the stamens to the pollinator (see photo). Bruce has been a pioneer in developing variegated Alcantareas. He is still looking for variegates, but will need to get seed from the wild to further this search. 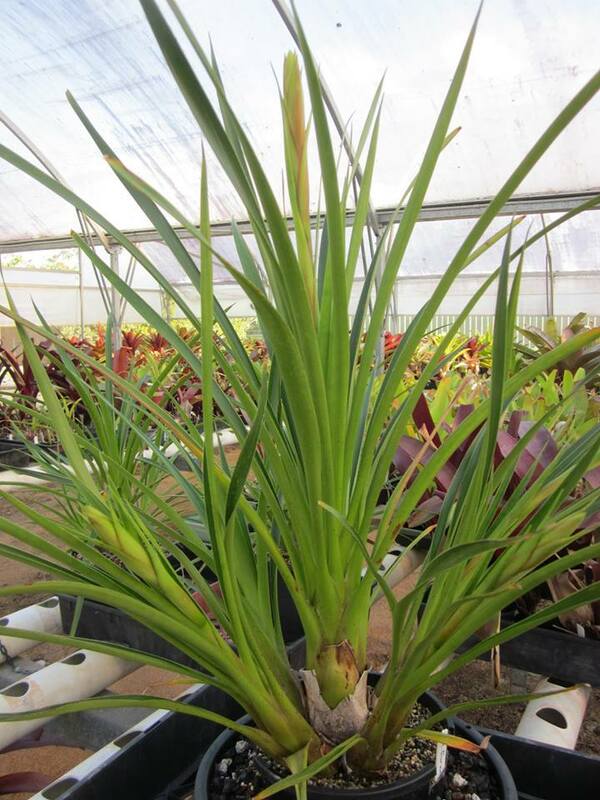 After growing thousands of seedlings of Al extensa, he developed Al 'Bobby Powell' in 2000. He introduced us to Al roberto-kautskyi which he photographed in Brazil. It has an arched inflorescence, not upright. Alcantarea odorata is stunning with its silver-grey colour. Thanks Bruce for another interesting talk. 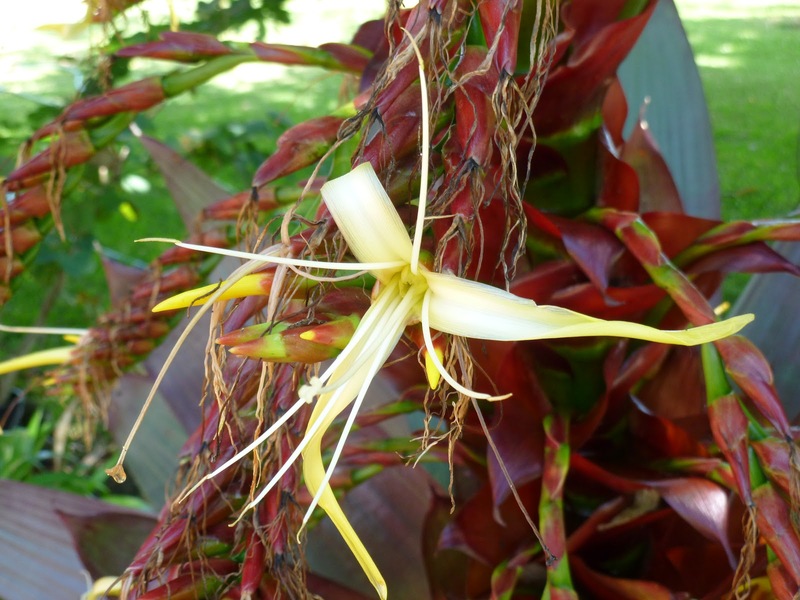 For further information on Alcantareas, see Bruce's article in the latest issue of Bromeliaceae. Alcantarea flower shows recurved petals exposing the stamens to the pollinator. Samuel introduced his friend/business partner Kevin who seems to operate a Nursery on a small piece of land in Singapore. Samuel began growing Tillandsias in his youth, in an apartment in the city. He started on the balcony, then hung them from the kitchen window, then from the bedroom window. Ed.It reminded me of the amusing talk given by Herb Plever at the BSI Conference in Cairns in 2007, describing the challenge of growing bromeliads in a highrise apartment in New York. The climate of Singapore has a great influence on growth of his plants. In the rainy season October to March, it rains daily, and from April to September it rains less! Humidity is commonly 95%. The weather is so wet that it is difficult to find suitable media that won't let the plants rot. Ed. 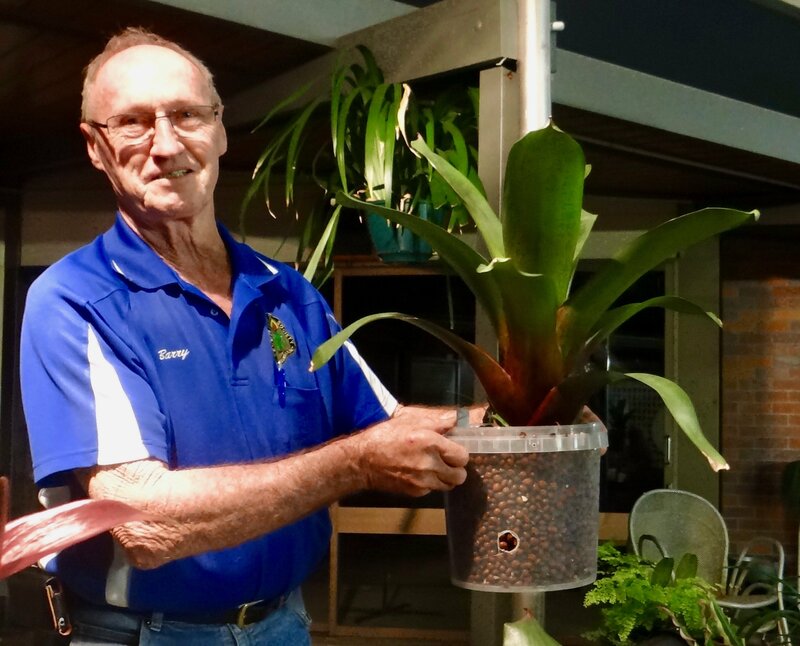 I remember when a BSQ member Bruce Hansen moved his collection to tropical Queensland over 5 years ago, many rotted from excess moisture, and he had to change to a fast-draining rocky medium. Sam grows plants in a shadehouse with 50% shade cloth. He grows the Tills pots without medium. He doesn't have room for it, and they seem not to need it. The water needs of Tills varies. Usenoides love water, can't get too much. Whereas T. cacticola and T. xerographica prefer to be dry. Most of his plants are misted three times daily. Then he showed at least a dozen of his plants, mostly familiar to us. The common finding was that the Tillandsia grew up to twice the size we would expect. Some grew so vigorously, that I barely recognized them. The other finding was a delay or no flowering. This is may due to failure to get to a cool enough ambient temperature. Relevant to this, Bob Hudson told us at the Tillandsia Day that Till bergeri does not flower in Cairns, because it doesn't get cold enough. 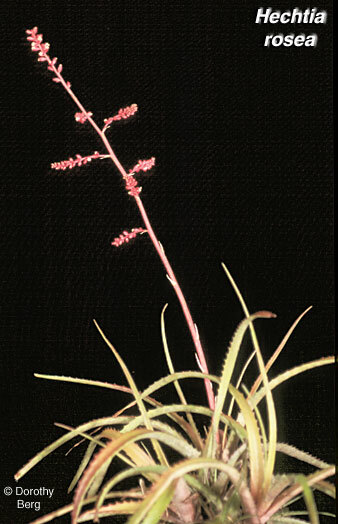 Sam's was a truly interesting revelation of the remarkable influence of tropical growing conditions on Tillandsias. Bob Cross showed this plant that he'd grown for years and failed to flower it, despite developing the pink central flush. 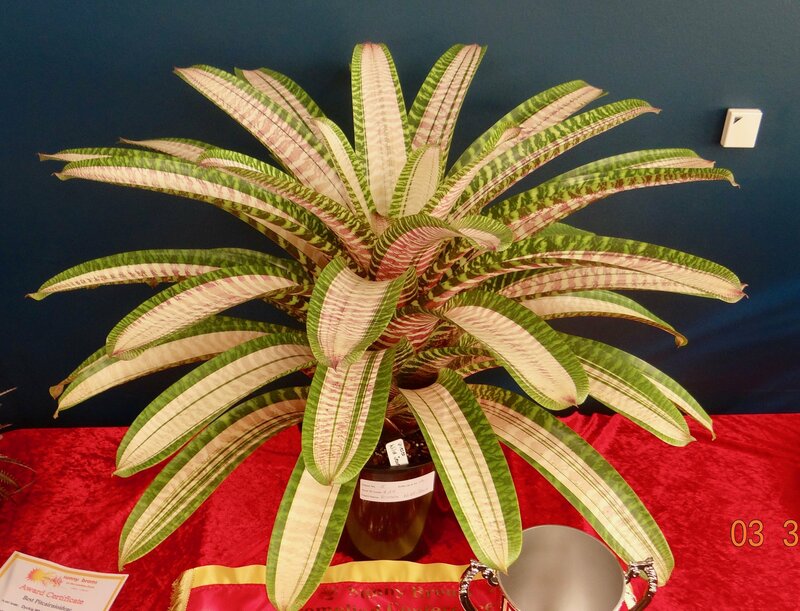 This bromeliad is one of the few Hechtias that boasts beautiful flowers. It produces a tall flower stalk with attractive pink/red flowers. The foliage also blushes red at the center when flowering, but not for Bob Cross. a period of cold conditions ? Till cacticola by Jenny Britten. 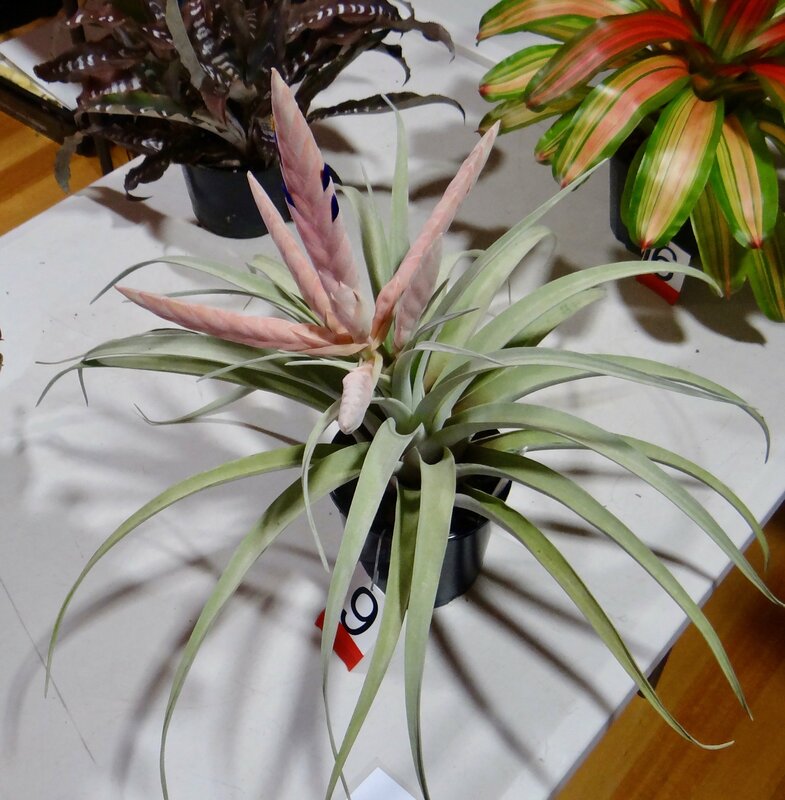 Till ionantha by Sharon Born. 1st. Till 'Evelyn Reilly' by Ron Jell. 2nd. 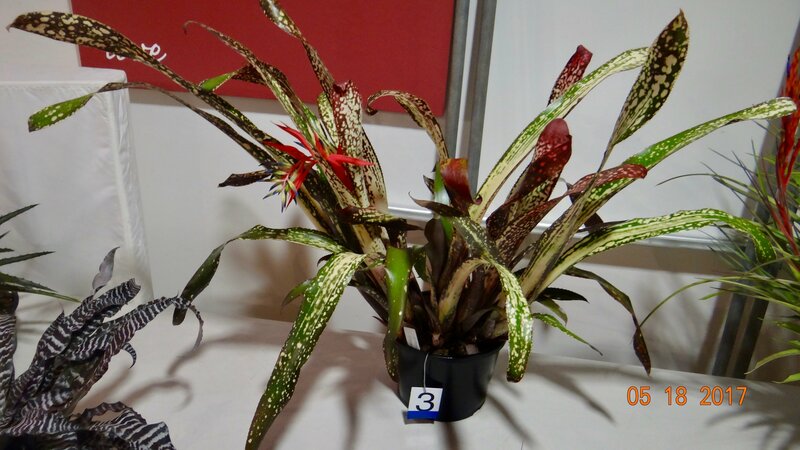 Billbergia 'Caramba' by ? 1st. 'Please Love Me' by Ron Jell. 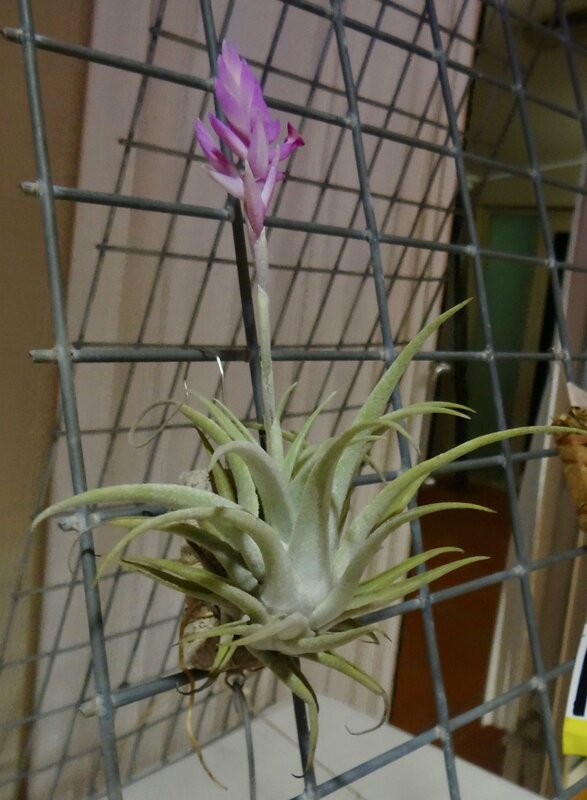 Tillandsia cacticola from Jenny Britten. 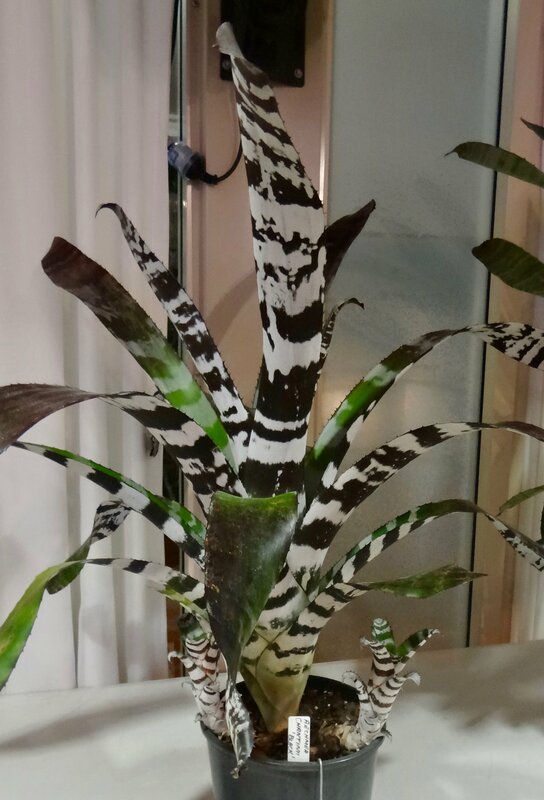 Billbergia 'Caramba', a Don Beadle hybrid. Show - Popular vote - see below. Plant of the Month - Vrieseas (or Lutherias) with Alan Phythian. Guest Speaker is Arno King speaks on Lessons Learnt from Ten Years of Landscaping with Bromeliads on an Acreage Property. Popular Vote Commentary with Narelle Aizlewood. Practical Session: Choosing Plants for Competition with Barbara McCune and Ron Jell. Plant of Month - Intergenerics. Guest Speaker - George Stamatis speaks on A Glimpse into the Future of Bromeliad Collecting in Australia. Mini Show - see schedule below.